What Are Some Improvements In Fishing Technology? Advances in technology for fishing have been amazing over the past 35 years. When I bought my first bass boat in 1974 it had a Lowrance flasher depth finder on the console. This depth finder showed a orange flashing light on a dial and would tell you how deep the water was under the boat, and if you studied long enough you could learn to identify fish, brush piles and other features. That was a huge jump from a few years earlier when anglers figured out bottom contour by looking at the bank, dropping lines with weights on them or by trolling and bumping the bottom. Those ways worked, that is how Linda caught her eight pound ten ounce bass in 1971. We learned about a long point by trolling Hellbenders over it, and that is where she caught the big bass. A few years later I bought a Garcia paper graph. This curved line graph marked on paper with a wire that actually burned off a coating on the paper when electric current passed through it. The current came from the spinning orange light on the dial just like on the Lowrance. That graph really helped me visualize the bottom and what the structure looked like. On my next boat I got a Lowrance paper graph. It printed a straight line reproduction of the bottom and everything between you and the bottom. It clarified even more what was below my boat and it and the next model I bought for my third boat probably taught me more than any other depth finder I ever had. The paper for those graphs was expensive and hard to change, and the wire stylus burned up fairly often. But they were the top of the line depth finders at that time, in the early 1980s. At about the same time Liquid Crystal Display (LCD) depth finders started showing up. They put on a video screen the same kind of information my paper graph showed, without the hassle. But they were not nearly as accurate as the paper graph. Now color graphs are available that will show a tiny baitfish swimming 30 feet below your boat. Every stump, rock and ditch on the bottom looks as clear as if you were looking at it directly. They are easy to use and almost all new bass boats have a color or black and white graph that is almost as good as my old paper graphs. My current boat has a combination LCD graph and Global Positioning Satellite (GPS) on the same screen. The GPS system was developed by the military and is currently used by huge numbers of hunters and fishermen. They are also standard equipment in many new cars. The unit picks up signals from orbiting satellites and gives you your exact coordinates based on latitude and longitude. I got my first hand held unit in 1997 and it was very basic, but amazing. I could put in a mark called a waypoint and it would remember it. If I marked a deer stand I could follow my trail back to it. If I marked an underwater brush pile I could find it every time I went fishing. The newer units can save your trail, something that is great if you are trying to make a run in your boat in the fog. You an avoid the bank by following it. Unfortunately, it will not show you other boats. My newest hand held unit cost me less than $200 and comes with a pre-loaded map in it. Every lake I have fished in the US has been on it, even some small 300 acre lakes in Wisconsin and Iowa. They were not perfectly accurate, but they are amazingly good for such an inexpensive unit. The one on my boat shows more detail but it costs a good bit more. My trip to Antarctica last January proved to me the unbelievable amount of information those hand held units can hold. It showed the tip of South America, locating small towns I had never heard of before. But most amazing of all, as we approached the Antarctic peninsula, my little $200 hand held Lowrance GPS showed the islands and mainland there. I could not believe it. Some folks think this technology is bad for fishing and hunting, making it too easy to find things. Maybe so, but I will continue to use it. It not only helps me find spots to fish, it guarantees I will not get lost in the woods or on a lake! This entry was posted in Bass Fishing, Fishing Tackle on June 28, 2014 by ronniegarrison. Can Electronics Help Me Catch Fish? Editor’s Note: Today’s feature comes to us courtesy of Traditions Media. One of the real joys of fishing occurs when warm spring weather draws fish of all species into skinny water. Anglers don polarized sunglasses and scan the shallows for emerging signs of life. The “sight fishing” that results can be positively thrilling. It’s high-level sensory stuff that combines stalking, hunting and casting into a singular stimulating experience. We’ve all got ’em. Stored in the glovebox, stuffed into a bulging Ziploc bag; those old paper lake maps provide basic navigation and occasional fishing spot info. But try to unfurl one in the wind, or break one out in a downpour. Not good. By now, most of us know about or have used a digital contour map displayed on a modern sonar/GPS unit. The advantages of a dynamic, interactive lakemap on your sonar screen is pretty profound. Products from LakeMaster (compatible with Humminbird sonar units) and Navionics (compatible with Humminbird and Lowrance) display lake, river and reservoir depth contours right on the screen, plus show your boat’s position as you move along and over various depths. When you catch a fish or see something that looks promising, you hit a button and drop an icon right on the map, so you can return and fish it anytime. You can even sit in your boat in the driveway, call up the map and drop waypoints on likely spots for later. Scattered and hidden across the floors of most waterways lie a treasure trove of hidden fishing locations-scattered rockpiles, discarded Christmas trees, isolated clam beds, bridge foundations and old roadbeds. All of these can be angling goldmines, and side-looking sonar is an awesome tool for finding them. So you’ve found that hidden heap of old Christmas trees, but how to know if anyone’s home? Sonar might show generic fish “arches.” But without knowing the species, size or position of the fish, you might use the wrong lure and fail to get bit. Worse, you could end up spending valuable time angling for carp that you thought were bass. It’s why some of the sharpest anglers today deploy an underwater camera, which shows you in real-time video exactly what’s happening below. While sonar might display a beautiful brushpile, the camera reveals what’s living there. It shows that some brushpiles are void of fish life. But it also shows you the good ones, those that hold heavyweight largemouths, pods of crappies or big catfish. Armed with this all-important intel, you’re now ready to tie on the right lure or bait and experience some fantastic fishing. Increasingly popular among anglers today are Aqua-Vu’s Micro systems. These self-contained underwater viewers sport tiny camera optics the size of an acorn, which easily slide into all those nooks and crannies in cover, and show you a real-life picture of every crappie, crawdad and clamshell in the vicinity. The LCD monitor is as small and compact as a smart phone, too, and the whole system stores easily inside a tackle box or even a coat pocket. If you’re not using a fishing cam, you’re could be missing out on some amazing and overlooked opportunities. “Spot Lock,” a GPS driven function built in to several trolling motors, including Minn Kota’s Terrova, holds your boat continuously on an exact waypoint, simply by pushing a button on a remote control. Anytime the boat drifts 5 or more feet off course, the motor quickly propels you back to your position. Modern underwater cameras provide unprecedented clarity and convenience, plus a nearly innate ability to find and identify fish. 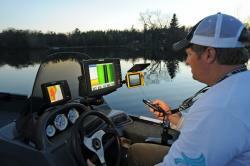 If you’re a fan of sight fishing in shallow water, you’ll love the visual aspects of doing the same on a sonar screen. When fish such as bass, crappies, walleyes, stripers and catfish drop deeper or suspend, you can position your boat right above them, drop a lure and watch them react on screen. Not only is sonar sight fishing entertaining and exciting, it’s also a very effective way to catch fish. Using Minn Kota’s Spot-Lock function or an anchor, position directly above fish in 15- to 30-or-more-feet of water. Next, tune your sonar unit so the transducer is using the narrowest beam (cone angle) possible. This can be done by switching from a wider beam to a narrower 18 or 12 degrees. Narrower beams provide more detailed information, and will allow you to watch your lure drop in the water column, as well as fish, as they swim over and bite. This entry was posted in Bass Fishing, How To on June 26, 2014 by ronniegarrison. Each month I write a “Map of the Month” article for Georgia Outdoor News. In these articles I go to a lake with a local expert and we discuss the patterns for bass fishing that will work during the month. Then we mark 10 spots on a lake map where you can fish those patterns, and describe how to fish each spot in detail. On a Sunday a few years ago the Flint River Bass Club had a tournament at Lake Allatoona. Although I have done several “Map of the Month” articles there over the years, I have never fished out of my boat there and never fished a tournament on that lake. I did not have a chance to go up and explore the lake and try to find some fish before the tournament. I pulled out a copy of my article on Allatoona in August, 2002 with David and Pansy Millsaps. I read it Saturday night and rigged baits they suggested. On Sunday morning I headed to hole number 1 in the article and started fishing as instructed. I quickly caught a 14 inch spotted bass on a tube jig on a boat ramp. I kept fishing that spot and caught a two pound spotted bass on a Carolina rig. I felt pretty good with two keepers in the boat on the first place and I had nine more to fish. As I idled to the second spot I read the instructions again – fish around the point with a jig and pig, then throw a crankbait before leaving. After fishing around the point twice, first with the jig and then with a Carolina rig, I had gotten no bites, so I started to leave. I remembered about throwing the crankbait so I picked up a rod with one tied on and hooked a good fish on the first cast. It was a 3.65 pound spotted bass and turned out to be the big bass of the day. When I headed up to hole number 3 skiers has churned the lake up pretty bad. I fished it and caught a short bass but no keepers. It was rough fishing in the waves, and the sun was getting hot. When I headed to hole number 4 I had to idle under a bridge and the shade felt good, so I stopped and fished there. I quickly got a hit on a small jig and pig and landed another two pound spotted bass. About 30 minutes later I caught another solid keeper on the jig and pig. That gave me my limit. I fished one more spot from the article but caught nothing there before heading to the weigh-in. We had 14 members fishing the tournament and my five bass weighing 10.8 pounds gave me first. The 3.65 pound spot was big fish for the tournament. Bobby Ferris had a five fish limit weighing 5.12 pounds for second, Don Schafer had 4.92 pounds for third and Kwong Yu came in fourth with 4.78 pounds. In the tournament three members caught five fish limits but there were six people without a keeper. We landed 26 bass weighing 33.61 pounds and there was only one largemouth weighed in. 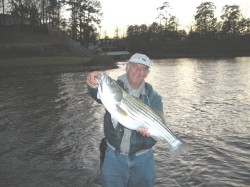 For many years Lake Allatoona has been called the “Dead Sea” because it was so hard to catch a bass there. The population of spotted bass has increased over the past few years, and now some decent catches come out of Allatoona. I was real lucky to have the article I wrote three years ago help me out in my first tournament there. That information really helped. Another tournament fishing the same places didn’t work as well. On a Sunday a few years ago eight members and guests of the Spalding County Sportsman Club fished our September tournament at Lake Allatoona. Three of the members managed to land five fish limits and there were two members that did not catch a keeper bass. Javin English had a limit and won with 5.55 pounds. Brent Terry fished with me and beat me out of the back of my boat with a limit weighing 5.48 pounds. I had a limit weighing 5.21 pounds for third and Jason Wheeler had two bass weighing 3.71 pounds for fourth. He also had big bass with a 2.73 pound fish. Many members caught a lot of bass shorter than the 12 inch limit. Although Allatoona has been called the “Dead Sea” because of its tough fishing, the eight of us weighed in 20 bass, but they were small. It is still a lot of fun to catch that many bass. Alltoona seems along way away since you have to drive right through down town Atlanta, but it was only 74 miles from my house, about the same distance as Sinclair or West Point. I caught my fish on a jig and pig and a jig head worm. Brent caught his on a Carolina rig. We caught most of them fairly shallow toward the backs of creeks. This entry was posted in Bass Fishing, Tournament Fishing on June 23, 2014 by ronniegarrison. Do We Need Another Marine Sanctuary? More Marine Protected Areas on the Way? President Obama says he’s planning to create the world’s largest marine protected area in the south-central Pacific Ocean. The announcement comes from the White House during Secretary of State John Kerry’s Oceans Conference underway this week in Washington. And like presidents Bush and Clinton, he’s doing it without the approval of Congress. Not everyone is a fan of the president’s use of the executive action, especially since he has already used the Antiquities Act of 1906 as grounds to designate eleven new national monuments on land, closing millions of acres of land. Opponents of his actions are quick to bring up the fact that his actions block any commercial activities on vast regions-including oil and gas development. More evidence, they say, of his obsession with alternative energy, despite the disasters of Soylindra and other administration-championed boondoggles. The administration’s response is that with the latest marine protection area it appears will “only” impact commercial tuna fishing. And there’s are still a few details that remain to be worked out. The White House says it has yet to determine the size of the new protected area- or determine what statute it would be created under. They also say there will be meetings and consultations with outside groups including environmentalists, the fishing industry and elected officials. Privately, fishing industry leaders tell me they expect to have the same voice in the decision-making process that the firearms industry was given in the administration’s drive for more stringent gun controls after the Sandy Hook tragedy. Additionally, Secretary of State Kerry is calling for the creation of a “global ocean strategy”. That, too, is resonating with environmental groups who have pushed for the closure of huge chunks of land and sea to virtually all human interactivity. In these latest announcements, it sounds as if the administration isn’t really differing from prior ones in their moves to protect our natural areas, but there is a key difference. When the Bush administration, for example, created a 140,000 mile marine area, it was designated a marine sanctuary not a marine protected area. According to the World Conservation Union definitions, there are several important differences: a sanctuary is an area designated free from hunting, while a protected area may have prohibitions on fishing, hunting or development- meaning the laying of cables or oil drilling. Under one designation, the species of the area are protected from overfishing or other harmful practices. Using the other; designated areas are off-limits to virtually any access beyond surface transit. That, too, may be strictly regulated or prohibited entirely. Protection of our natural resources is a responsibility each of us must share. Prohibition of the use of those resources, however, is not something we should permit. Responsible use and protection are not mutually exclusive. This entry was posted in Fishing Politics on June 22, 2014 by ronniegarrison. What Is the Best All Purpose Fishing Knot? If you want to be a successful fisherman, you have to know how to tie knots. Specifically, you have to know how to tie a variety of knots for different connections. You’ll need one you can count on for tying on swivels, snaps and lures; another for adding a shock leader, and still another for tying fluorocarbon or monofilament leaders to braided line. It’s also a good idea to know how to snell a hook. There are dozens of books on the subject of tying knots and hundreds of knot variations – some basic and some for special purposes. Some are easy to tie. Others are so complex you could go through a spool of line just trying to get it right sitting at a table; and then you have to duplicate it when you’re on the water. Trying to memorize techniques for tying a bunch of different knots is confusing. That confusion can lead to mistakes and ultimately knot failure. Any knot that is poorly tied can slip or cut into the line causing a failure under considerably less pressure than the breaking strength of the line. When a knot fails, fish get away and all that’s left is a curl at the end of the line and a sinking feeling that the fish was lost due to angler error. There’s a simple knot that typically tests out to 90 percent or better than the breaking strength of the line and is capable of handling a wide variety of connections. It’s actually more then just a knot; it’s a knot system, and once you get a little practice, it’s easy enough to tie in the dark. It is appropriately called the Uni-Knot. In its most basic form, the Uni-knot is excellent for connecting snaps, swivels and lures, and pretty much any kind of terminal tackle, using monofilament, fluorocarbon and even most braided lines of any pound test. The drawing shows how the knot is wrapped, but here’s how to tie it in detail. 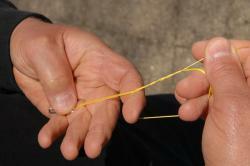 Picture 1: Start by running about 12 inches of line through whatever you’re tying on and put it in your hand like this. Picture 2: Bring the two segments of the line parallel and create a loop around your pointer and middle fingers. Picture 3: Wrap the tag end of the line through the loop and around both standing lines at least five times. When using braid, increase the number of wraps to six or seven. Picture 4: Slowly pull on the tag end until the knot cinches up, but don’t pull it tight. Picture 5: Wet the knot and pull firmly on the standing line until the knot slides into place and tightens around the eye. Then clip off the excess tag. Practice it at home and you will be able to tie it in 15 seconds or less, even on a rocking boat. This knot is the foundation for several other knots, making it the most versatile fishing knot you can learn. Some lures, like jigs, work better when attached using a loop knot. 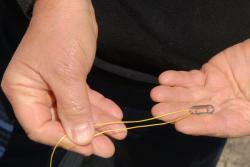 The loose connection allows the lure to swing more freely at the end of the line. Nothing could be easier than using a Uni-Knot for this purpose. Tie the knot exactly the same way, but do not cinch it down to the eye of the lure. Leave it an inch or two away and using a pair of pliers, pull the tag end of the knot very tight to lock it in place. 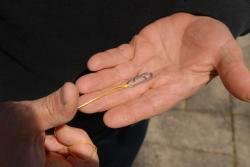 Bait hooks with offset eyes are designed to be attached using a snell. 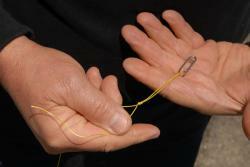 This type of attachment allows for a straight pull from the line to set the hook. The Uni-knot can be used for this purpose and doesn’t require you to learn a totally new knot. Simply pass the line through the eye of the hook, make a loop with the tag end, and make the five wraps around the line and the shank of the hook. 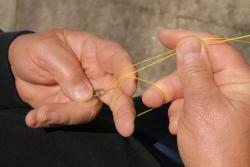 Then pull the tag end, wet the knot, and complete the knot by pulling on the standing line. There are many occasions where an angler has to join two pieces of line together. Adding a heavier shock leader to your running line and connecting a length of fluorocarbon or monofilament to the end of braided line ensure the fish won’t see the line connected to your bait or lure. With a Uni-to-Uni connection, it doesn’t matter if the lines are of different types or vastly different diameters. All you do is place the two lines alongside each other, and tie a basic Uni-Knot in one, cinching it up lightly, then turn them around and tie another Uni-Knot in the other exactly the same way. Wet both knots and pull firmly on both standing lines until the two knots come together. A final hard pull seats them together for a strong connection. This entry was posted in How To on June 20, 2014 by ronniegarrison. My first six bass boats were all on single axle trailers and I could move them around to hook up to my tow vehicle easily. All I had to do was back up close to the trailer then move it by hand. When I bought my current boat it had a dual axle trailer and I quickly found it was almost impossible to move the tongue of the trailer if I did not back up perfectly. At the Georgia Bass Chapter Federation Top Six several years ago one of the sponsors, Marineovations, LLC, had a demonstration video tape of their trailer hitch system. I bought one and have found it extremely helpful when hooking up my boat, especially when I am alone. The system consists of a special ball mount that goes into a hitch receiver on tow vehicles. It has a small square mount on top that holds two other parts of the kit. One is a “V” shaped flat iron guide that has the “V” right above the trailer ball. When you back up, your trailer coupler will be guided right to the top of the ball. It is a simple matter to lower your trailer onto the ball. Trailer Trapper that fits right over the ball and coupler. A pin holds it in place and there is no way the trailer can come off the ball. According to the Marineovations site, there were 24 people killed in traffic accidents in Georgia in 2004 when their trailer came unhooked while driving. The main purpose of the Trailer Trapper is to keep the trailer hooked to the tow vehicle no matter what happens. In all my miles of towing boats, I have never had one come unhooked, although I did lose a flatbed trailer once when backing up. The Trailer Trapper would have prevented that. I love the ease of hooking up now. It is never a problem. And I like the safety of the Trailer Trapper, knowing it is an added level of safety. One other part of the system that I like is a 12 volt light on a pole. Wires lead through the pole and can be plugged into your vehicle system where the trailer lights hook up. The pole the light is one will expand to about six feet tall, and the light is bright enough to give you good light for backing up, cleaning fish at night and even running the weigh in for a night club tournament. The light was given to me to try out, I did not buy it, but I do like it. This entry was posted in Fishing Product Reviews on June 19, 2014 by ronniegarrison. Can A Hummingbird 360 Help Me Catch Walleye? EUFAULA, Ala. (May 13, 2014) – Water bodies and the fisheries they contain are dynamic systems, changing over time. A good example is famed Minnesota walleye fishery Mille Lacs, which has been the focus of a heated debate over the past several years. Yet, whatever side of the debate you line up on, one thing is certain, changing fisheries require new and innovative approaches to catching fish. Case in point, the recent success of tournament walleye anglers Jon Thelen and Mike Christensen, who took first place and lapped the field at the Minnesota Tournament Trail event held on Mille Lacs. “Since the introduction of zebra mussels into Mille Lacs, the water clarity has steadily increased to eight feet or more. As a result, walleye behavior has changed on many different levels, forcing us to adapt,” says Jon Thelen. But Thelen is quick to admit that he and Christensen spent four hours during pre-fishing scratching their heads trying to figure out where the fish were. But Thelen didn’t stop there. He wanted proof that the boat was spooking fish off the rocks. The rest of the pre-fishing day was spent moving from rock pile to rock pile, looking for fish on 360. If they saw fish, they’d throw out slip bobber rigs, wait for confirmation, and then move on, dropping waypoints on their LakeMaster map for tournament time. From pre-fishing epiphany, experimentation and verification, the team put their findings to the ultimate test a couple days later during the tournament. “We knew that during the tournament all we had to do was to anchor upwind of these rock piles and throw our floats over the top,” says Thelen. Although the fish behavior had changed, the presentation was kept classic: a 1/32-ounce pink and white Lindy jig head tipped with a leech under a Thill slip float. At the end of the day, tournament check in hand, Thelen says he learned a valuable lesson running 360 Imaging on Mille Lacs. 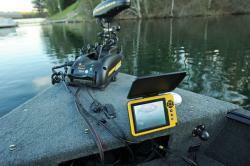 (1) Humminbird 859 Combo – Split-screen view of LakeMaster mapping and 2D sonar. Often set to DualBeam 83/200 kHz setting for vertical jigging. For more information visit humminbird.com, contact Humminbird, 678 Humminbird Lane, Eufaula, AL 36027, or call 800-633-1468. About Johnson Outdoors Marine Electronics, Inc.
Johnson Outdoors Marine Electronics, Inc. is a wholly owned subsidiary of Johnson Outdoors and consists of the Humminbird®, Minn Kota® and Cannon® brands. Humminbird® is a leading global innovator and manufacturer of marine electronics products including fishfinders, multifunction displays, autopilots, ice flashers, and premium cartography products. Minn Kota® is the world’s leading manufacturer of electric trolling motors, as well as offers a complete line of shallow water anchors, battery chargers and marine accessories. Cannon® is the leader in controlled-depth fishing and includes a full line of downrigger products and accessories. This entry was posted in Tournament Fishing, Walleye and Sauger on June 18, 2014 by ronniegarrison. Back in the late 1990s I started visiting a newsgroup, Recreation – Outdoors – Fishing – Bass (ROFB). Newsgroups were popular back then and there were thousands of them available. Each one was on a specific topic and you could go post messages to others with similar interest. They have pretty much gone now, being passed by with new forms of interaction on the net. The guys on ROFB started having a get-together tournament on Center Hill Lake in Tennessee, called the Mid-Tennessee Classic. I could not attend since I was still working but I enjoyed reading about those trips. I planned on attending when I retired and had time to go. In June, 2001 when I retired Steve Huber in Rhinelander, Wisconsin decided to host the North Woods Classic in the fall with the same group. He invited us to come to Rhinelander and experience the fishing there. So, on Labor Day that year, I hooked up my boat and headed 1100 miles north. Those were great trips and I went to eight of them, as well as attending three of the Mid-Tennessee Classics. I made some good friends on those trips and got to fish with guys from all over the US. But the Tennessee tournaments ended after a few years and in 2009 Steve moved to Paris, Tennessee, ending the trips to Wisconsin. Some of us still keep in touch through Facebook and emails and we decided to revive the Mid-Tennessee Classic this year, but on Kentucky Lake, near Steve’s new home. So a little over a week ago I hooked up my boat and drove 400 miles to Paris. We had a great time, renewing old friendships and making new ones. We ate together each night and I fished with a different person each of the three days I was there. I had not fished Kentucky Lake since 1983 so it was like visiting a totally new lake, especially since we were about 40 miles by water from where I had fished so many years ago. I drove up on Wednesday and met up with Larry and Moe from New York and Steve Thursday morning for breakfast. We headed to the lake about 9:00 AM and Larry and I went exploring. On a new lake I try to find something that looks familiar to the way I like to fish here, but after four hours I was very confused. Kentucky Lake is huge, over 100 miles long and over a mile wide where we fished, and it is very shallow near the bank in most areas. By 1:00 I had landed a few small bass, including the five Larry and I caught in 15 minutes beside one cypress tree in two feet of water on an island. Bass there have to be 15 inches long and they were hard to find. A little after 1:00 I spotted something that reminded me of Clarks Hill – a gravel point at the mouth of a small feeder creek. When I got near it the water was about 10 feet deep a good cast off the bank, and there were button bushes in the water and a big willow tree hanging over the water. Larry and I started fishing and when I pitched a jig and pig under the willow I caught a 18 inch largemouth that encouraged me. A few yards further down the bank I got a hit and landed a beautiful 19 inch smallmouth. That was really encouraging. Smallmouth have made a big come back there since 1983. That year, in a three day tournament I fished with 72 fisherman, exactly one smallmouth was weighed in. Now they are fairly common. After fishing into a small pocket further down the bank Larry hooked a nice keeper largemouth that jumped then broke his line when it ran under the boat. I told him I knew where I would start the next morning. That night we had a great meal at a small BBQ place, sat around a picnic table at the motel and talked, then got some sleep. Moe fished with me the next day and we headed to my honey hole first thing. But we could not catch a keeper even though baitfish were everywhere. At about 10:00 Moe got a keeper but all I could catch were short bass, so we decided to go somewhere else. While going under a bridge I saw current was running, a good sign, so we stopped and started casting to pilings. We caught over a dozen short bass and I managed to land a very skinny 15 inch keeper. At least I would not zero! With an hour left to fish I told Moe I really wanted to go back to where we started and he agreed. With 30 minutes left to fish I caught a keeper largemouth off the gravel bank then got another keeper on a rocky point on it. At weigh-in I had three weighing 5.5 pounds and was in first place, a big shock! That night we ate and shot the bull, and I drew Kevin as my partner the next day. Kevin is from Illinois and I had fished with him in Wisconsin so I knew we would have a good day. Of course we headed to my favorite place and Kevin quickly caught a three pound largemouth, a good start. After a couple of hours I had not caught a keeper. We went into a very shallow pocket and I said it was way too shallow, but I got a hit by a bush in a foot of water and caught a short fish, then caught a keeper off the next bush. That seemed worth trying so we worked further into the creek, pitching a jig to very shallow bushes. By one I got a hit and landed a 4.5 pound largemouth. We kept working that pattern and I caught two more keeper largemouth, lost two more that would have gone about three pounds each, and a smallmouth that was so close to 15 inches I really wanted to keep it but didn’t take the chance. With just an hour left to fish I was casting a jig head worm to the rocky point and landed a 17 inch smallmouth, filling my limit. I was shocked at weigh-in when I had five of the eight bass brought to the scales. They weighed just under 13 pounds and my four pounder was big fish. So I won our reunion tournament, and really enjoyed seeing everyone. We are planning on doing it again next year! Saturday night I left Paris at 9:00 and arrived at the ramp at Sinclair at 5:00 AM for the Flint River June tournament. It was tough, with 15 members and guests landing 38 bass weighing about 50 pounds. There were two limits and one person didn’t have a keeper. Larry Cook won with four bass weighing 6.10 pounds and had big fish with a 3.08 pounder. Rick Burns had four at 6.10 for second, Niles Murray had a limit at 5.76 pounds for third and my five at 5.68 pounds was fourth. I was worn out but made it home and got some sleep! This entry was posted in Bass Fishing, Fishing With Family and Friends, Tournament Fishing on June 17, 2014 by ronniegarrison. Is HR 4742 Good For Fish, Fishermen & The Recreational Fishing Industry? The Strengthening Fishing Communities and Increasing Flexibility in Fisheries Management Act (HR 4742) introduced by House Natural Resources committee Chair Doc Hastings (R-WA) is an effort to improve and strengthen provisions of the current Magnuson-Stevens Fishery Conservation and Management Act (Magnuson-Stevens). In the days since this bill successfully moved out of committee, scores of recreational fishermen and industry professionals have reached out to the Recreational Fishing Alliance (RFA) for perspective. Having lobbied for 7 years to incorporate some limited management flexibility in the law while highlighting the bureaucratic problems with meeting restrictive congressional mandates using “fatally flawed” data, RFA sees HR 4742 as a terrific step towards addressing many of the problems faced by saltwater anglers today. One portion of the bill would allow an extension to the time required to rebuild a fish stock beyond the existing 10-year requirement in certain cases. This language is similar to rebuilding language included in legislation previously introduced and supported by the RFA, except that HR 4742 does not include limits on the length of the rebuilding extension. RFA has argued against the rigid and inflexible nature of fixed rebuilding deadlines since the last reauthorization of Magnuson Stevens, when a three-year extension in the summer flounder rebuilding deadline was plugged into the law in the 11th hour to address a rapidly approaching deadline for that Atlantic Coast fishery. The three-year extension proved that fisheries could be rebuilt with a little bit of management flexibility while anglers continued to access a fishery. “The fisheries management councils are now asking for this flexibility, and after dozens of hearings in the House Natural Resources Committee, members now understand the need for change,” Donofrio said. HR 4742 would also make modifications to allow the regional fishery management councils to set ‘annual catch limits’ in consideration of changes in an ecosystem and the economic needs of fishing communities. It would also permit councils to set multiyear annual catch limits to afford some stability in recreational specifications. RFA explains that this section is important given that there is no data collection program in existence today that can estimate recreational landings on a level accurate enough to reasonably apply annual catch limits to the recreational sector. “The methodologies used by NOAA Fisheries were designed to show trends over multiple years and broad geographic ranges, which is precisely why RFA has argued for exemptions in the recreational sector from enforcement of these annual catch limits as written under the present law,” said Donofrio. Under this portion of the bill, regional councils could exercise some flexibility in setting annual catch limits in the recreational sector, which could assist our beleaguered red snapper fishermen in the South Atlantic and Gulf of Mexico. In specifically addressing the red snapper issue, Rep. Hastings’ bill also directs federal funding through the Saltonstall-Kennedy Act towards development and implementation of a real-time reporting and data collection program for Gulf of Mexico red snapper. As referenced above with regard to the open-endedness of timelines along with other issues, Donofrio said the Hastings bill is good but not perfect. “There’s a piece that gives the Secretary of Commerce the ability to increase the length of emergency regulations and interim measures from 180 days to 365 days–that’s a free ticket to declare fisheries closed without public participation and input,” he explained. However, having spent the past 7 years pushing Congress to consider legislation to incorporate limited management flexibility in the law, RFA is hopeful for change despite trepidation by some members of the recreational fishing industry. “I know some members of the community are adamant for example that Magnuson-Stevens includes a national policy for recreational fishing, but NOAA Fisheries is presently working to create a national policy so let’s not bog that down in a broken congress,” Donofrio said. Another debate has emerged of late with regard to something known as ‘ecosystem-based’ fisheries management, specifically managing those ecosystems for forage base. While Donofrio said anglers may understand ecosystems and bait, putting that onus on Congress to define the terms for NOAA Fisheries to follow is another bureaucratic logjam waiting to happen. “Imagine if the folks at Pew or Oceana decide that there may be special corals at your favorite sea bass or red snapper reef, next thing you know you’re not allowed to fish on that particular ecosystem,” Donofrio said. Some of the Pew-supported groups have tabbed the Hastings bill as the ’empty oceans act’ claiming the legislation will roll back vital conservation measures necessary for healthy and sustainable fisheries, which Donofrio calls gross exaggeration. With key amendments added to the Hastings bill by Rep. Steve Southerland (R-FL) and Rep. Frank Pallone (D-NJ), there’s a lot to be excited about with HR 4742; but now comes the tough part getting the House and Senate together on a conference bill which the President can sign into law which will truly benefit the fish, the fishermen and the fishing industry. This entry was posted in Fishing Politics on June 16, 2014 by ronniegarrison.